Buy a few bars of sandalwood or spice scented soap, and crochet some soap washcloths, or soap bags, for those hard-to-buy-for men in your life! Rnd 1:Ch4,9dc in 4th ch from hook,join with slip stich in top of chain3. Rnd 2:Chain 3,double crochet in the same stich, 2 dc in each st around,join as before. Rnd 3:Ch 10,sl st in next st (19 times),ch 5,join with dtr in first ch of first ch 10. Rnd 4:chain 8,sl st in next lp(19 times),ch 4,join with trin top of dtr on last rnd. Rnd 5:ch 4,sl st in next lp(19 times),ch 2,join with dc in top of tr on last rnd. Rnd 6-20:ch 4,sl st in next lp(19 times),ch 2, join with dc in top of dc on the last rnd. Rnd 21: ch 2, slst in next lp(19 times),ch 2,join with sl st in top of dc on last rnd. Rnd 22: ch3, s dc in next lp,dc in next sl st(19 times),2 dc in last lp, join with sl st in top of chain 3. Make a chain 36 inches long, sl st in top of 30th st of rnd 22, turn; sl st in each chin across. Fasten off. Make a 15 inch chain, turn; sl st in each chain across. Fasten off. Weave draw string through rnd 22. 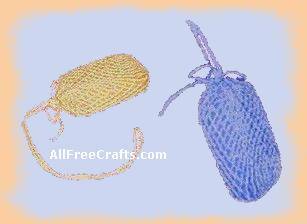 Place your soap the bag and pull draw string tight and tie into a bow.